But the video promoting this system could be said to run in line with that of a typical get-rich-quick scam. You’re shown clips of Lamborghini’s, fancy mansions & people taking vacations all across the world… So what’s the deal here, is it actually legit or is the Internet Income Explained system a scam that’s just set to part you with your hard earned cash? What Is Internet Income Explained? The website for the Internet Income Explained system presents you with a pretty eye-catching video, but to be honest not a lot else. In the video you’re introduced to 2 people, Kameron George & Keala Kanae – these 2 guys claim to have “cracked it” online & claim that they can show you everything you need to know so that you too can start making the big bucks online like them, even if you’ve never made a penny online before. In fact that’s likely the reason you’ve landed here – to find out if Internet Income Explained is actually legit or whether it’s just another scam… And that’s why I put this review together because I knew people would be wondering that very thing like I did when I first came across it. So what I will start out by saying is that no, after signing up to it myself I don’t believe it to be a scam, however there are some “catches” that you should be aware of before you even think about joining which I’ll go over in just a moment. How Does The Internet Income Explained System Work? Okay so here’s the deal, the Internet Income Explained system isn’t actually a system at all. I know, that might sound a little confusing but bear with me here & it will all become very clear as to what it actually is. The Internet Income Explained website is actually just a sales page for the AWOL Academy program, a program I have previously reviewed on this blog. I will come straight out & say that I actually found the AWOL Academy program to be a pretty darn good program… Expensive, but good. However it did have it’s flaws & that’s why it’s not my top recommendation – you’ll hear about those in a moment but firstly I want to explain how it actually works so that you can get a good understanding of it. So, with that being said if you sign up with the Internet Income Explained website & pay the entry fee of $49 you will find out that what you have actually purchased is the AWOL Academy training program. The AWOL program is basically a step-by-step course on making money online through something called affiliate marketing. The good news here is that you weren’t lied to in the video on the Internet Income Explained website, the stuff they promised you does actually hold true… Kinda. What you will realize though is that you don’t actually get access to everything right away. The $49 fee that you pay to “get in” really is just the entry fee. It gives you access to some basic training & some videos that welcome you into the system but in reality that’s about it. From this point you’ll find that if you want to continue progressing through the training you’ll have to keep spending more & more money to purchase all of the different packages. In total you could spend around $10,000 before you even get access to the full course. So the first point I want to make here is that whilst they claim this program is good for those with limited funds, in my opinion it isn’t. Don’t get me wrong it is a good program & you could certainly make money by following the training they provide you with but I do believe that in order to get off the ground with AWOL Academy you do need to invest a fair amount of money. The high price alone led to some people calling AWOL Academy a scam, but honestly I’ve been through the training – it’s not a scam, it’s just expensive. It’s unlikely that the people calling it a scam have actually been through the training… You can’t just call something a scam purely because of it’s cost. Okay so whilst I do believe this program to be legit, as I mentioned earlier in this review there were a couple of reasons why it hasn’t took the top spot as being my number 1 recommended program. The first reason is because I believe things are made out to be a little easier than they actually are with this program. I mean don’t get me wrong, the training is good & it’s easy to follow… However what they don’t tell you about is the potential trial & error that’s involved. The AWOL Academy program is heavily focused around Facebook advertising & that’s not going to send you into profit right from the off. Instead you’ll have to try out different approaches but the issue here is that you’ll be “playing” with real money. For that reason you could see yourself losing a lot of money before you ever start making it. Secondly, another issue is the sheer cost of the program. Yes, I’m a firm believer in that people can charge whatever they like for they programs (as long as they don’t mislead people)… But in this instance I just feel like $10k+ is an awful lot of money for training that you could obtain elsewhere for a fraction of the cost – or even for free. Essentially all of the information is available “out there” online, you’re just paying to have Keala & Kameron present it to you in a step-by-step fashion. A good alternative place to get free affiliate marketing training (and tools) is Wealthy Affiliate. Similar to AWOL the training is laid out in a step-by-step easy to understand fashion, but with WA there is no crazy high-ticket costs involved. If they had built & included a bunch of the tools & incorporated them into their own system then I would have definitely had a different view of AWOL & potentially it could have competed against my top ranked program… But as it is sadly it’s not so good. My Verdict – Is Internet Income Explained a Scam? Well no, it’s certainly a scam – but as I mentioned earlier it’s not actually a system in itself either… It’s just a sales page that’s been designed by Keala Kanae & Kameron George to get you to buy into their AWOL Academy program. 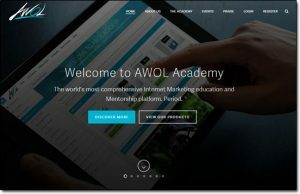 The AWOL Academy program overall is actually a pretty good program but in my personal opinion it’s just way too expensive, and as you progress through you’ll see the costs quickly mounting up – not just from the additional training packages you need to buy, but the additional tools & resources they push you into buying too. Don’t get me wrong though you could indeed make money as a result of following AWOL’s training however since it’s heavily based around Facebook advertising (which is known as paid traffic) it’s going to mean that in order to pull it off you’ll likely need to have a big stack of cash ready to invest – and potentially burn. The bottom line is that I just personally believe there are better alternatives available, such as Wealthy Affiliate for example. Through WA you can learn all the same stuff you can at AWOL but unlike AWOL they provide you with all the tools & things you need too. Is Partner With Patrick a Scam? My Honest Review Uncovers The Truth! Trading With John Miller – Scam or Legit? My Review Exposes This Phony System!